The political wheel has come full circle. 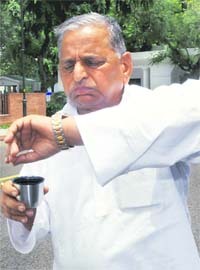 Four years ago when the UPA was formed, the Congress had discarded the Samajwadi Party (SP) and instead sought support from the Left parties to prop up the new government. The Left parties are not inclined to withdraw support to the United Progressive Alliance (UPA) government during Prime Minister Manmohan Singh’s visit to Tokyo to attend the G8 Summit. The leaders of the four Left parties, namely Prakash Karat (CPM), A.B. Bardhan (CPI), T.J. Chandrachoodan (RSP) and Debabrata Biswas (Forward Bloc) met here on Friday. Should reality shows be monitored for abuse? Marriage, Job, Immigration, Foreign Tour, Business, Solve with Sidh Hindu Remedies. The Punjab State Electricity Regulatory Commission (PSERC) today affected a nominal increase in the tariff for both domestic and industrial consumers even as it came down on the Punjab State Electricity Board (PSEB) on the issue of interest charges on loans taken by it. The past has caught up with Punjab Vigilance chief Sumedh Singh Saini. Indicting him for his alleged involvement in the torture of “proclaimed offender” Balwant Singh Multani and “missing person” Balwant Singh Bhullar in connection with the 1991 bomb attack on him. 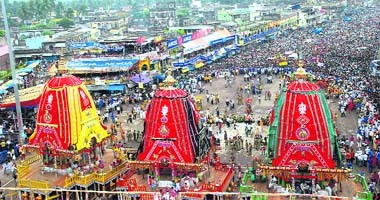 Tragedy struck the annual rath yatra here with six persons being crushed to death and several others injured in a stampede as the idol of Subhadra was being brought out from the Lion’s gate of the 12th century Jagannath temple today. The Supreme Court today refused to intervene in the matter pertaining to the Jammu and Kashmir government's decision to revoke the transfer of land to the Shri Amarnath Shrine Board, but directed the authorities to provide security to pilgrims stranded in the state due to the turmoil over the issue. Fresh communal violence erupted here today leading to the imposition of a curfew in the entire Indore city, a day after four persons were killed in clashes during the BJP-VHP-sponsored bandh against revocation of land to the Amarnath Shrine Board.